Witte + Sutor GmbH are the technological and innovative leaders in the development of rechargeable lighting. All over the world the AccuLux trademark is considered a guarantee of quality, excellent design, technical perfection and absolute safety. Further the ThermoLux brand name is synonymous for our “green area”, whose range of products includes warming mats for plants, aquariums, terrariums, heated drying pouches for hearing aids, foot-warmer mats and a seed culture equipment. As early as 1955 AccuLux set up a new standard in environmentally friendly lighting with the development of the world’s first rechargeable lights. We received a gold medal at the World Exhibition in Brussels in 1958 for our model Original 70. In our 55+ years our company has had over 70 registered patents. In 2000 we developed high-tech industrial and emergency lighting for the first time. Since then we have been continuously involved in the development of LED technology. We developed the first rechargeable LED torches models LED 2000 and Multi LED and an LED Otoscope for medicine and LED flashlights. Witte + Sutor GmbH, whose headquarters are in Murrhardt, is characterised by the typical advantages of a medium-sized company as high flexibility, innovation strength and lean and decision friendly management. Furthermore our know-how constantly increases in co-operation with renown scientific institutes. Flexible-head safety lamp, compact in size, for installation in vehicles or buildings. Angle head lamp: extremely bright and light weight: non-rechargeable or rechargeable version. Working and emergency lamp incl. Charging station; for installation in vehicles or buildings. 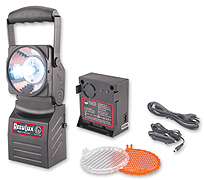 Unique for hazardous areas: torch directly rechargeable at any 230V socket. Hand and helmet torch for almost every purpose: bright, shockproof - waterproof depth 5m. Small size torch: fits in every pocket; bright, shock proof and very good price value. Comfortable head lamp with extreme bright Power LED: two step switch for brightness and flexible head.